Looking for some quick cleaning hacks for kids' rooms that will make them look (almost) newly decorated? 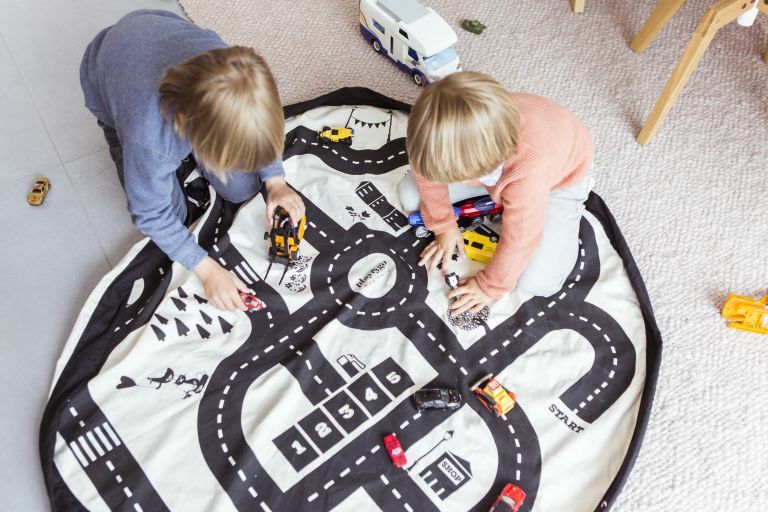 Cleaning children's rooms needn't be a heinous task if you keep on top of the smaller cleaning jobs, whether keeping bedlinen and mattresses fresh or removing 'artwork' they've doodled on the walls. These are our favourite easy hacks for cleaning kids' rooms and – it goes without saying – their toys, too. You can find more cleaning tips, hacks and advice on our dedicated hub page. Starting from scratch? Find out how to design a kid's room, too. If they wear shoes indoors, they'll be grinding bacteria and dirt deep into the fibres of the carpet or rugs that can’t be removed by vacuuming alone. And, since small children tend to play on the floor, that means transferring those bacteria from the floor to their mouths, risking diarrhoea, stomach pains, nausea, vomiting and fever. Find out more about the best ways to get rid of household germs in our feature, and... er... if they have been wearing shoes indoors, find out how to give their carpets and rugs a good clean with our guide. Buy the best carpet cleaning products and the best prices in our quick-glance buyer's guide. For when you need something a little more heavy duty, we've found the best carpet cleaning machines. Use toothpaste, rubbed with a soft cotton cloth, on wood (whether furniture or flooring) to remove marker pen stains. Scrub pen marks off walls lightly with a damp sponge sprinkled in baking soda. For crayon, scrape away excess with a credit card, then dab with methylated spirits. For felt pens or ink, dab with an absorbent pad and methylated spirits. Putting their soft toys on a hot wash in the washing machine will kill off bacteria – group them in a pillowcase to ensure they stay in one piece. If your little one won't be parted from their toy long enough for it to be washed and dried (but it's getting stinky), you can put it in a paper bag with a little bicarbonate of soda; shake the bag and leave for an hour or so, then vacuum or shake off the powder. Get rid of dust mites if your child has an allergy by freezing the toy in a plastic bag. Then take outside and give it a good shake. If your child's mattress is getting a bit musty, there are tons of fixes. Step one is to vacuum the mattress, then sprinkle with bicarbonate of soda, leave an hour and vacuum again. Step two is to air the mattress regularly – this might mean never making the bed, but pushing the covers right back every morning until they get back into bed at night. Best ways to clean urine stains. How to clean blood stains. How to clean up vomit. Use our guide to cleaning mattresses to find out more – and to find out how to spot treat other stains. Lastly, it's worth using mattress protectors for larger beds, and waterproof mattress protectors for kids' beds. Plasticine or Play-Doh: scrape off as much as possible with a credit card and dab the dye stains with white spirit. Chewing gum: freeze item and the gum with a bag of ice cubes (or put it in the freezer if it will fit). Once it becomes hard and brittle, break it away with a knife. Contact adhesives and glue: dab with acetate (nail polish remover), and it will loosen. Always spot-test first, to ensure you won't be doing further damage. Chocolate: scrape away and vacuum up as much as possible with a knife, then mix a solution of warm water and laundry powder and brush on with a soft nailbrush or old toothbrush (in the direction of the pile if on a carpet). Dab with clean water to remove all soap then blot dry with kitchen roll. Makeup: scrape off as much as possible with a knife, then dab with a mixture of one part clear vinegar and two parts warm water. Dab with clean water then blot dry with kitchen roll. Nail polish: carefully dab (not wipe or scrub) with a small amount of acetate nail polish remover. Plastic toys, minus any stickers or batteries, can go in the dishwasher – and this is something we'd really advise if your child has had a recent stomach upset. Be aware that anything delicate may need a cooler wash.
Or you can put non-absorbent toys (without batteries, obviously) in a bath full of hot water diluted with bleach. Leave them to soak, then drain, rinse with the shower attachment and allow to air dry. Bath toys (while we're at it) can become mouldy (usually inside). Washing them regularly as above will help, but the best option is prevention, so squeeze each toy until the water is out after every bath time and allow to dry. If you do spot black mould coming out when you squeeze them, replace them. Find more about getting rid of mould and mildew in our guide. If you love wooden furniture but your child has bashed their bedroom (or your bedroom or living room) furniture to pieces, you can cover up the scratches by using a matching coloured wax crayon, artists' paint or shoe polish. Once it's absorbed, polish with furniture wax to help fill any indentation. Washing kids' bedding, such as duvets and pillows, at least once every three months (more if they suffer from allergies) is a must, but getting a duvet and pillows into a machine can be a challenge? Our favourite cleaning hack for kids' rooms? This one: take them to a launderette and let their machine take the strain. Ensure all bedding is dried thoroughly before putting them back on the bed. Bedlinen itself needs to be washed at 60ºC to kill bacteria. Use our other best ways to do washing to get on top of your laundry hacks. If you know clutter like Marie Kondo knows clutter, you'll know that an over-stuffed, under-organised room is a haven for bacteria, dust mites and all sorts of other unidentifiable nastiness. So, find out how to declutter their rooms like Marie Kondo (if you've not heard of her, she's the force behind the craze for tidying up). Clever ideas for kids' book storage. Storage ideas for kids' rooms.